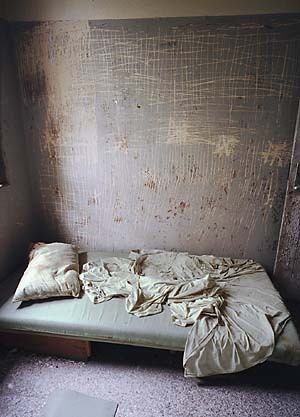 I found this picture here, amid a collection of photos of the abandoned Hospital for the Insane. It was taken by Shaun O'Boyle and you can see the rest of his amazing photos here. She clawed at the wall, mindlessly engraving lines in its worn surface. Blood caked on her fingertips like crusted paint. She thought of spilled ketchup and food coloring and all the other things she thought the mess on the kitchen floor was before she remembered - it was her mother’s blood, all sticky and gummy and staining her sneakers; it was her mother laying there, scratching her fingers against the kitchen wall, trying to pull herself up. She imitated her mother’s movements, right down to the death twitch at the end. Then she started again. They told him over and over. He kept saying no. They kept at him day after day. Still no. They took away his clothes. No. They wouldn't let him bathe. No. They did what could not be bourne. Suddenly, they let him loose. They followed him for a week and picked him up again. For six years, he said NO every single day. Then just to have something new to do, he said Maybe. They let him go, he went to his father's house, and hung himself. This experiment was a success. They walked through the house, horrified at the damage done during their vacation. The sofa and chairs lay demolished, smashed to bits. Shattered bowls covered the kitchen floor, their insides caked with a crusty paste, gone rancid and moldy. Mary held their only son, quaking and weeping quietly. John knew he should call the authorities, but instead he grabbed a a baseball bat and climbed the stairs. There, in the boy's bedroom, the vandal waited. A pretty blonde girl, eyes wide with rage and madness. She turned from raking the wall with her fingernails, just as John swung the bat.